Scott K Reed is chair of Fitzpatrick, Cella, Harper & Scinto’s litigation practice group. Mr Reed is known as a “consummate trial lawyer who discerns how to persuade the judge and jurors” and who produces “consistently excellent results” (IAM Patent 1000 2012). He is a “versatile operator with extensive first-chair experience” (IAM Patent 1000 2013) and brings “a lot of sage advice and experience” (Legal 500 2012) as well as “his ‘enthusiasm’ to cases, leading a ‘professional’ team” (Legal 500 2008). 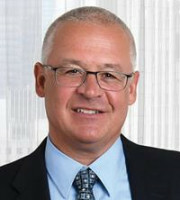 Mr Reed has extensive trial experience and has served as lead trial counsel in cases involving pharmaceuticals, biotechnology, chemicals and electronic and computer technologies. He focuses his practice on the trial and appeal of complex patent litigations for a number of technology leaders. Mr Reed serves on the firm’s management committee. “Excellent patent litigator who becomes very knowledgeable of case details” (LMG Life Sciences 2017). “[A] versatile operator with extensive first-chair experience” (IAM Patent 1000 2013). “[B]rings a lot of sage advice and experience” (Legal 500 2012). “[B]rings his ‘enthusiasm’ to cases, leading a ‘professional’ team” (Legal 500 2008).